The Ameise® electric pallet truck is an affordable entry level model in the field of electrically powered pedestrian pallet trucks. 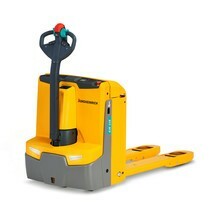 It provides welcome assistance with the rapid transport of loads and pallets weighing up to 2000 kg. 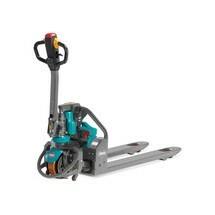 The pallet truck is designed for light-duty use as part of the in-house goods traffic of small and medium-sized operations with occasional transport requirements. The Ameise® electric pallet truck represents an affordable entry point into the world of electrically powered pedestrian pallet trucks. It is designed specifically for use in small and medium-sized businesses with occasional need for a heavy-duty goods transport solution. 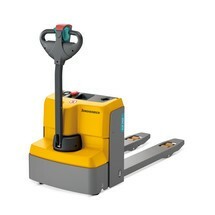 The reliable 1.5 kW drive motor assists you in transporting pallets and goods weighing up to 2000 kg. 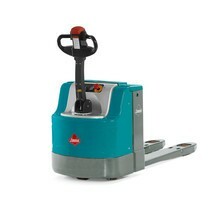 The low platform truck with a special support width of 685 mm is ideally suited for lifting wide special pallets. The lift, travel and lower functions are controlled via the ergonomic tiller handle, which can be operated with either hand. 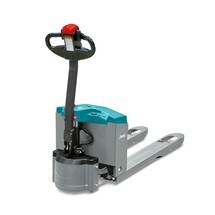 The pallet truck is very easy to steer and is highly manoeuvrable in tight spaces thanks to its compact design. All important control instruments, such as the hour meter, battery discharge indicator and emergency disconnect are positioned centrally in your direct field of view. You therefore always know when the battery needs to be recharged. Another welcome feature is the maintenance-free 150 Ah gel battery, which eliminates the need for laborious, time-consuming water replenishment. 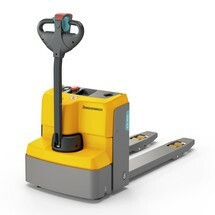 Thanks to the on-board charger, you can easily recharge the electric pallet truck at any 230 V socket. The dual hydraulic system ensures smooth lifting and is as reliable as it is durable. The powerful and maintenance-free three-phase AC motor combines pleasantly swift acceleration with excellent handling characteristics. Support rollers on either side of the drive wheel provide additional stability. 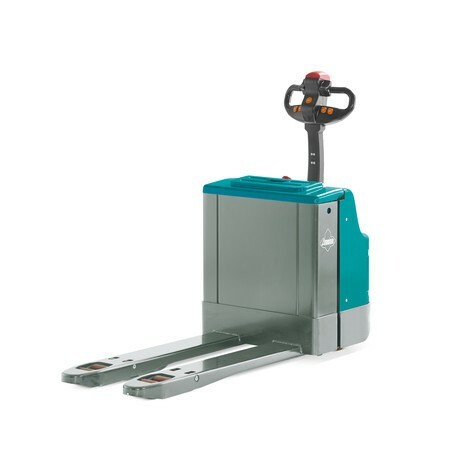 The drive wheel and tandem fork rollers are made from robust polyurethane and offer high-quality, comfortable and low-noise travel combined with maximum capacity and a long service life. The reduced noise of the travel and lift functions also makes the pallet truck ideal for use on the shop floor in the retail sector, in supermarkets and in DIY stores. The Ameise® electric pallet truck with 2000 kg capacity represents an affordable entry-level model for your heavy-duty transport needs. 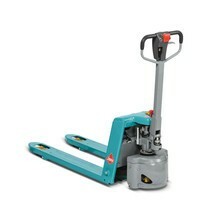 Benefit from tried-and-tested Ameise® quality by purchasing the cost-effective pallet truck from our shop today.